Professional athletes push their bodies to the limit every time they train and compete, so ensuring that they have the right nutritional support to help them perform and recover faster is key. Vitamin D is an essential part of this support with a new review in the Journal of the American Academy of Orthopedic Surgeons (JAAOS) reporting that higher vitamin D levels have been linked to reducing injury and improving athletic performance. Orthopedic surgeon and lead study author Geoffrey D. Abrams, MD explained that with higher serum levels of vitamin D playing a role in muscle strength, injury prevention and sports performance, it’s essential for individuals to take necessary steps to ensure they’re getting an adequate amount of vitamin D intake. According to the review, vitamin D supplements help to increase muscle strength in athletes who are vitamin D deficient with daily supplementation proven to be more effective than weekly or monthly doses. 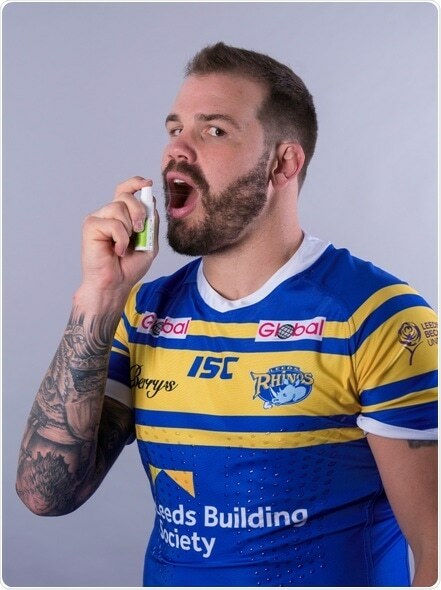 Rugby Super League Champions the Leeds Rhinos have undergone cutting edge vitamin and mineral testing as part of their official partnership with natural health company BetterYou, to identify the nutritional gaps that could impair athletic gains. All the players undertook a vitamin D NHS blood spot test along with a hair sample mineral analysis (to check their magnesium levels) by laboratory Mineral Check at the beginning of the season in 2017. The players results were fascinating to see. As a collective, the majority’s vitamin D levels were optimal (equal or higher than 100nmol/L) due to recent sun exposure, which is good news as vitamin D is essential for strengthening bones and immune function. However, even though their levels were on average higher than the general population, a third of the players had sub optimal levels, which needed to be improved. Vitamin D levels in athletes is greatly important. As demonstrated in this new review. When we looked at the players mineral analysis, close to all of them had sub optimal levels of magnesium, based on their calcium/magnesium ratio. Over half had high levels of calcium in relation to magnesium intake. This is not surprising as the players eat a western diet which tends to be rich in calcium and low in magnesium. The key here is keeping magnesium and calcium in balance. An imbalance could be associated with numerous health conditions ranging from cramping to heart disease. Where calcium is high relative to magnesium there could be a risk of excessive deposition of calcium into the soft tissues (arteries and muscles). Ideally a healthy ratio would be 3-parts magnesium to 1-part calcium or below. This would allow the body tissues to effectively manage excess calcium and function more efficiently. BetterYou has now created a bespoke supplement plan for each player for its oral vitamin D spray and transdermal magnesium products which are absorbed through the skin. Following the results, we have worked with the BetterYou team to establish a daily supplement routine to elevate the players vitamin D and magnesium levels. In addition, we have also been supplementing the guys on vitamin B12 and vitamin K2. The products are so easy for the guys to build into their daily routines and they are already seeing the benefits. They are bouncing back quicker and have also mentioned that they are seeing improvements in their sleep. An oral spray is an effective alternative to tablets and capsules in elevating vitamin D, as it delivers the vitamin directly to the bloodstream via the soft tissue within the mouth avoiding the digestive system. Oral sprays can be taken at any time of the day and are not reliant on food or water. Seven in ten of us suffer from low levels of magnesium. And because we don’t get enough from our daily diet, a supplement that gets straight to where it’s needed is the way to recharge our systems. Studies have shown that supplementing magnesium transdermally (through the skin) is an effective way to absorb this mineral. This delivery mechanism bypasses the digestive system straight into the body tissue providing a fast and effective dose directly to where it’s needed.